Republican Darrell Issa currently represents Congressional District 49. Issa is expected to easily win re-election in 2016. Congressman Darrell Issa represents the people of California’s 49th Congressional District in the United States House of Representatives, a seat he has held since 2001. 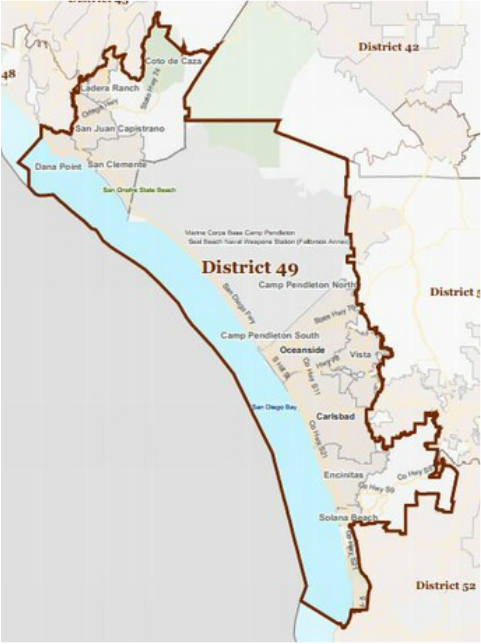 The 49th District includes Camp Pendleton, the largest Marine Corps training facility in the United States, and the northern portions of San Diego County and southern Orange County. Congressman Issa and his wife Kathy live in Vista, CA. They have one son, William, and celebrated their 30th wedding anniversary in 2010. As a senior in high school, Issa enlisted in the United States Army. Through his Army service, he received an ROTC scholarship and graduated with a degree in business from Sienna Heights University in Adrian, Michigan. Upon graduation, Issa was commissioned as an Army officer, and ultimately obtained the rank of captain. He completed his active-duty military service in 1980 and turned his interests to the private sector. At the height of his career in business, Issa served as CEO of California-based Directed Electronics, a company that Issa founded and built in the mid-1990s to become the nation’s largest manufacturer of vehicle anti-theft devices, including the highly-successful Viper system. In 1994, Issa was named Entrepreneur of the Year by Inc. Magazine, Ernst & Young and The San Diego Union Tribune. During his leadership of Directed Electronics, Issa served as chairman of the Consumer Electronics Association, an organization of 2000 companies within the consumer technology industry that hosts the annual Consumer Electronics Show in Las Vegas. When he stepped down as CEO to serve as a Member of the U.S. House of Representatives, Directed Electronics employed nearly 200 people. As a Congressman and leader in California grassroots politics, Issa has championed the cause of smart, efficient government, and has pushed legislation to balance the federal budget and promote transparency across the federal bureaucracy. In 2003, Issa was the architect behind the successful popular uprising to recall former Democratic California Governor Gray Davis. Issa currently is a member of the House Judiciary Committee, where he serves as Chairman of the Subcommittee on Courts, Intellectual Property, and the Internet, and the House Foreign Affairs Committee. He served as the Chairman of the Oversight and Government Reform Committee during the 112th and 113th Congresses. Previously, Issa served on the House Permanent Select Committee on Intelligence, the the Energy & Commerce Committee, and the Small Business Committee. As the holder of 37 patents himself, Issa has been vigilant about protecting the intellectual property rights of artists and other entrepreneurs to help protect America’s position at the forefront of innovation and creativity in the entertainment and technology industries. His successful efforts to fight human trafficking along the United States border has resulted in tougher laws, stiffer penalties, and more consistent enforcement. His watchful concern to guarantee that U.S. taxpayers receive the royalties they are owed from mineral interests on federal lands exposed fraud and mismanagement at the Mineral Management Service (MMS) in 2006. In 2008, when Congress was asked to pass the Troubled Asset Relief Program (TARP) in the wake of an historic financial crisis, Issa stood by his instincts as a businessman and opposed giving a blank-check bailout to Wall Street – he voted against all bailouts during the financial crisis. Refusing to give up and concede to those who favored a bailout-centered response to this and future financial failures, Issa put forward a proposal to create a bipartisan commission to uncover the root causes of the financial crisis. This idea was passed into law in early 2009 and the investigation commenced in January 2010. Issa expects the results will reveal government mistakes and protect U.S. taxpayers from future runaway government intervention in the financial and housing markets. Recognizing his success as a Congressional watchdog of taxpayer dollars, at the beginning of the 111th Congress House Republicans tapped Issa to serve as the top Republican on the House Oversight and Government Reform Committee, which is the main investigative committee of the United States House of Representatives charged with the protecting the interests of U.S. taxpayers and eliminating waste, fraud and abuse in the federal bureaucracy. Under his leadership, the committee undertook numerous detailed investigations of the Countrywide Financial VIP Program that benefited government officials with special reduced-rate mortgage loans, the illegal use of taxpayer dollars by the Association of Community Organizations for Reform Now (ACORN), the decades-old misplaced government agenda to manipulate the U.S. housing market through Fannie Mae and Freddie Mac that created the housing crisis, the politicization of science at the Environmental Protection Agency (EPA), and a broad investigation into the financial crisis of 2008-2009. As a fiscal conservative committed firmly to low taxes and free markets, Issa has opposed the rise of out-of-control government spending and fought tirelessly for the responsible, transparent use of taxpayer dollars.